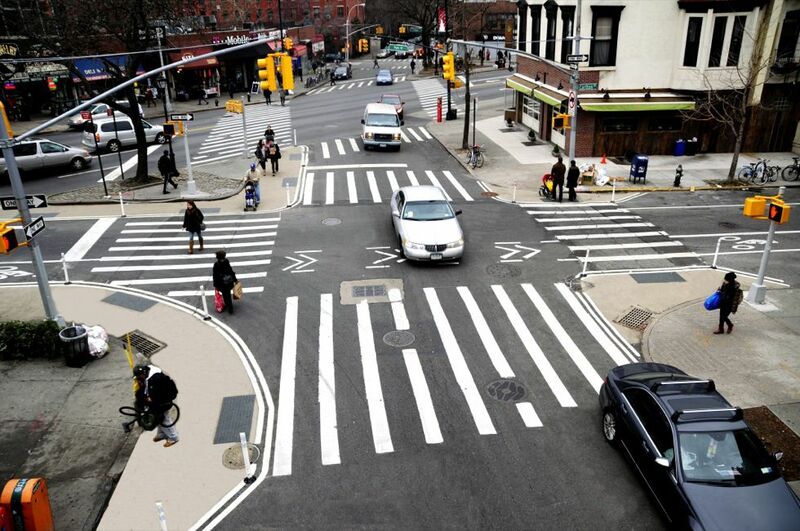 Corner radii directly impact vehicle turning speeds and pedestrian crossing distances. 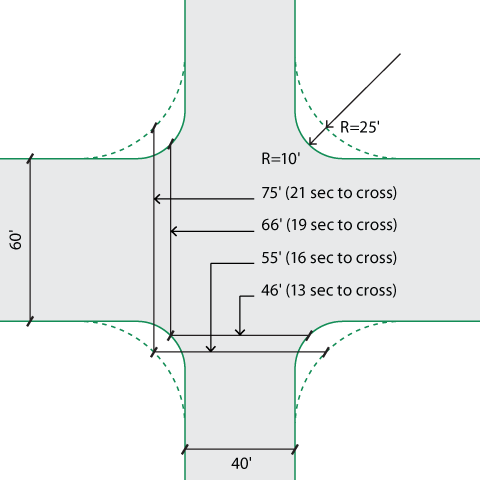 Minimizing the size of a corner radius is critical to creating compact intersections with safe turning speeds. 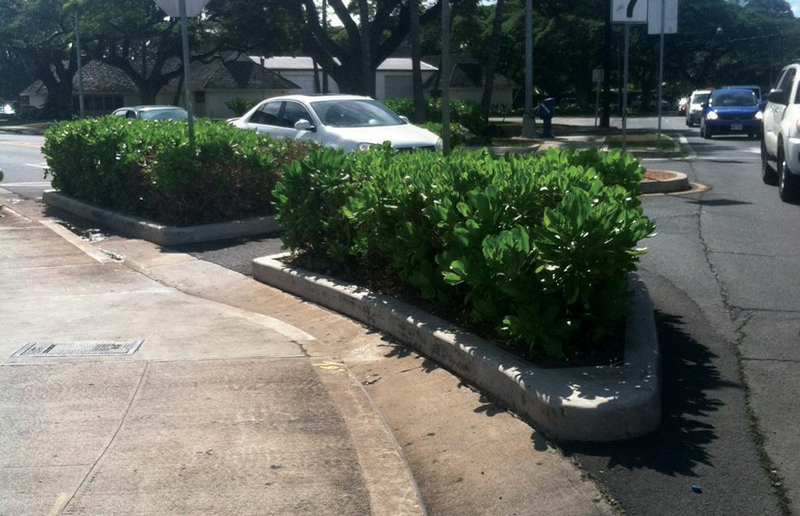 While standard curb radii are 10–15 feet, many cities use corner radii as small as 2 feet. In urban settings, smaller corner radii are preferred and actual corner radii exceeding 15 feet should be the exception. 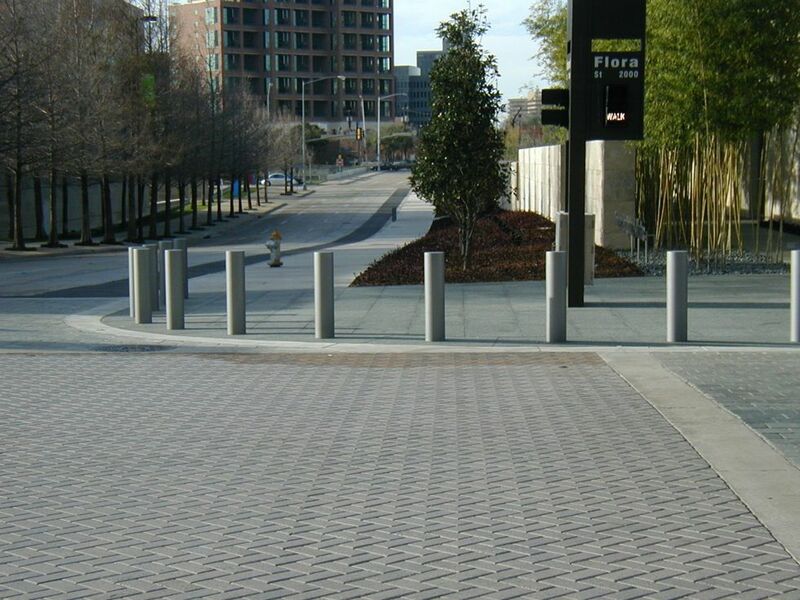 A smaller curb radius expands the pedestrian area, allowing for better pedestrian ramp alignment. The distinction between the corner radius and the effective turning radius is crucial and often overlooked. 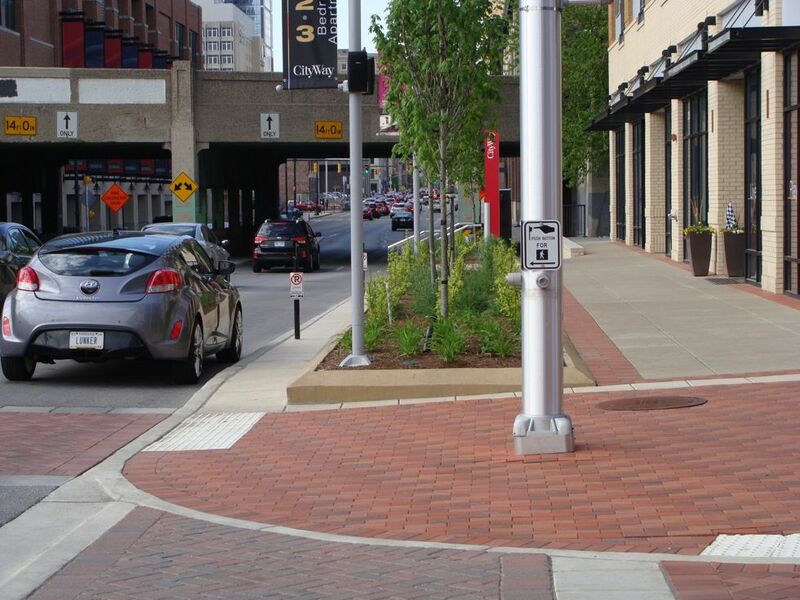 The corner radius may be a simple or a complex curve and depends primarily on the presence of on-street parking, bike lanes, the number of travel lanes, medians, and traffic control devices. 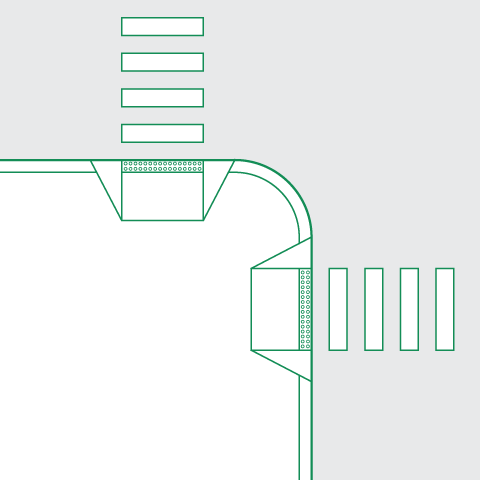 Designers often determine corner radii based on the intersection geometry only and overlook the effective radius. As a result, drivers making a turn on a green signal have little incentive to turn into the nearest receiving lane and routinely turn as wide as possible to maintain travel speeds. Click to enlarge. Click to enlarge. Select the smallest possible design vehicle. 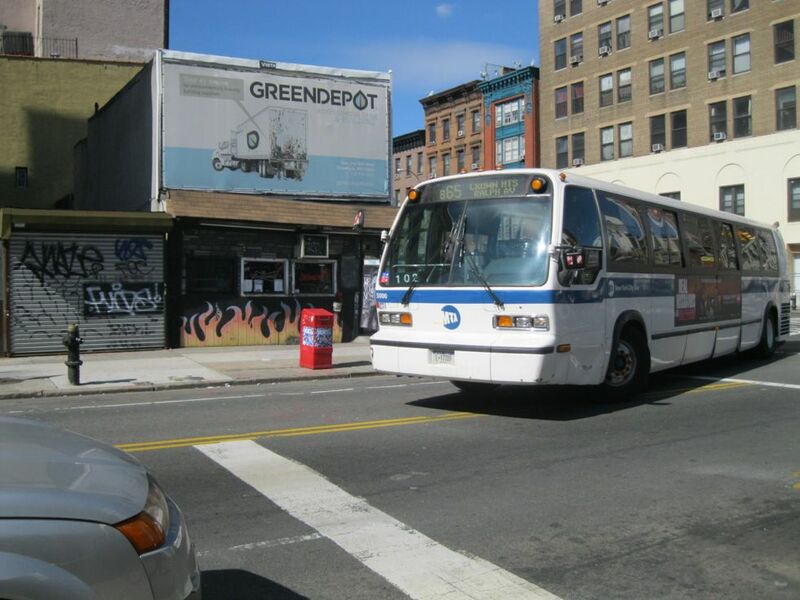 Accommodate trucks and buses on designated truck and bus routes. Restrict right turns on red so there is no expectation of turning into the nearest receiving lane. 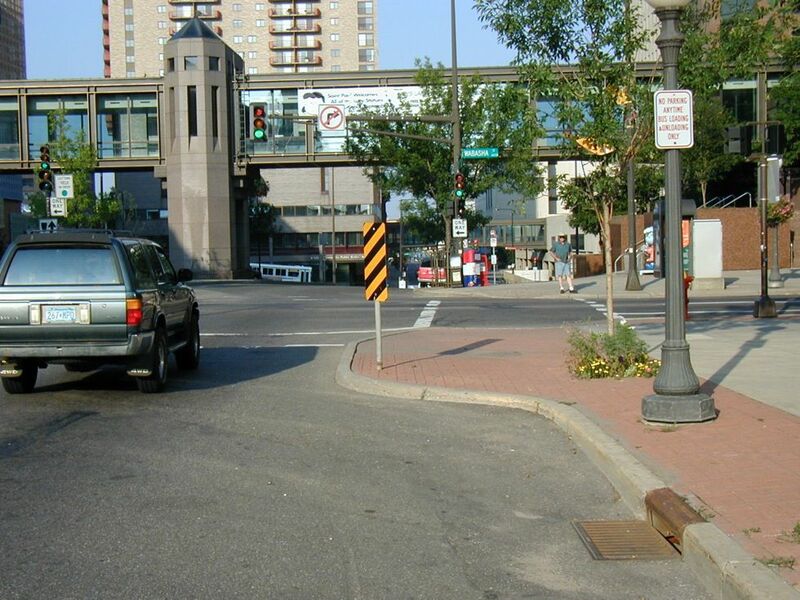 Design so that emergency vehicles may utilize the full area of the intersection for making turns. 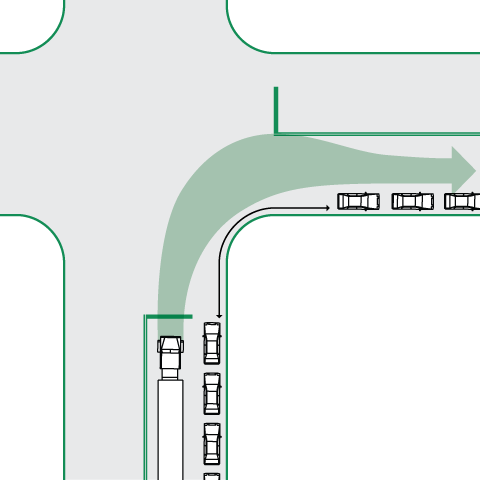 Various methods that accommodate large vehicles, while restricting the turning speed of smaller vehicles, may be used to avoid unnecessary widening of the intersection. 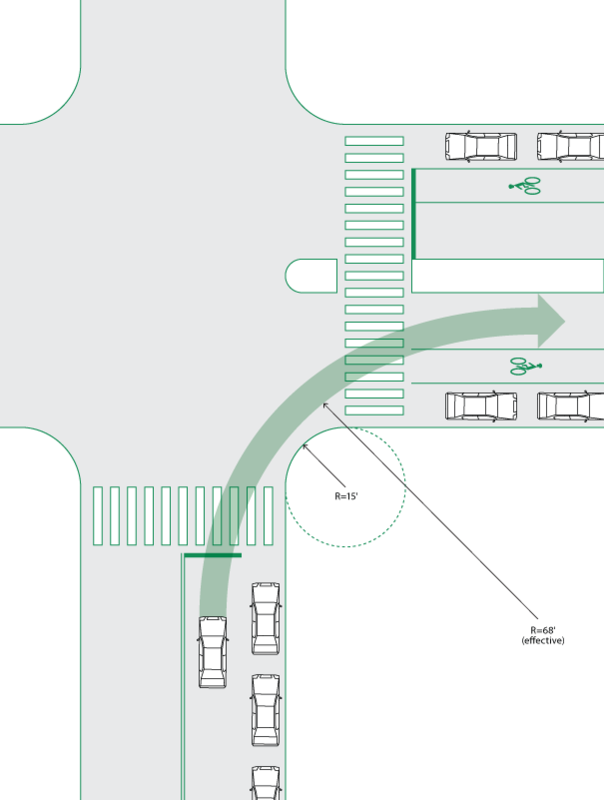 Narrower streets with curbside travel lanes may require larger corner radii because the effective turning radius mirrors the actual corner radius. 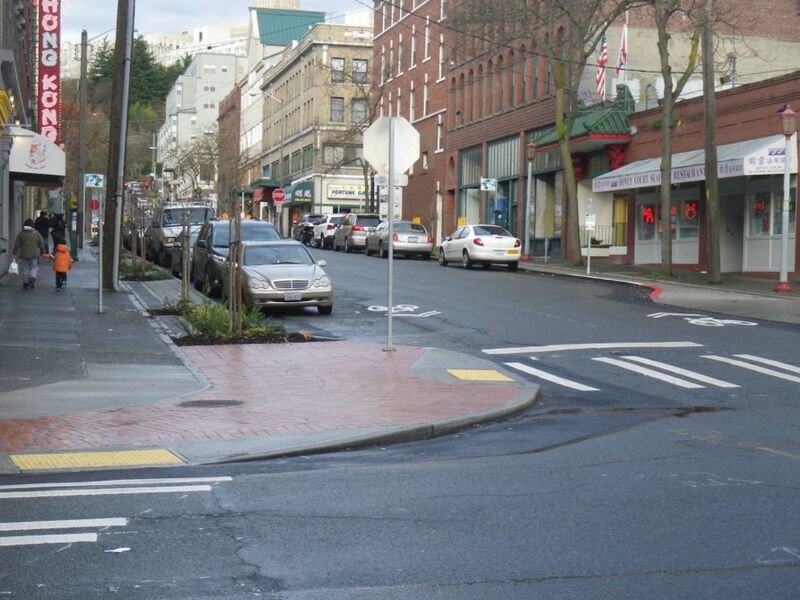 The same holds true for streets with curb extensions. Streets should not be designed with larger corner radii in anticipation of the entire roadway being used for vehicle traffic at some point in the future. Kendra K. Levine, Curb Radius and Injury Severity at Intersections (Berkeley: Institute of Transportation Studies Library, 2012), 2. 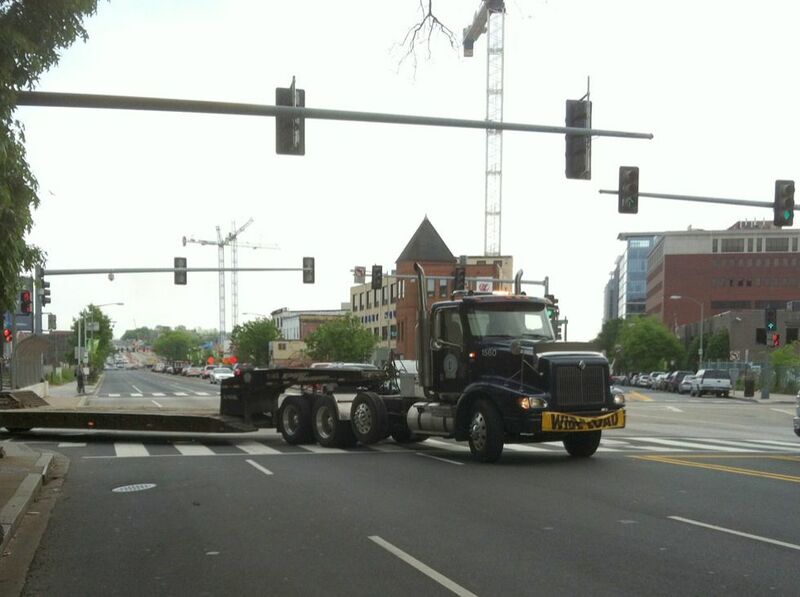 Research has shown that large trucks will have “little impact” at most urban intersections, but some adverse operational effects should be expected at some intersections. Joseph E. Hummer, Charles V. Zegeer, and Fred R. Hanscom, Effects of turns by larger trucks at urban intersections, (Charlotte, N.C.: Transportation Academy, Dept. of Geography and Earth Sciences, University of North Carolina at Charlotte, 1988). Kay Fitzpatrick and William Schneider, Turn speeds and crashes within right-turn lanes, (College Station, Tex: Texas Transportation Institute, Texas A&M University System, 2005). 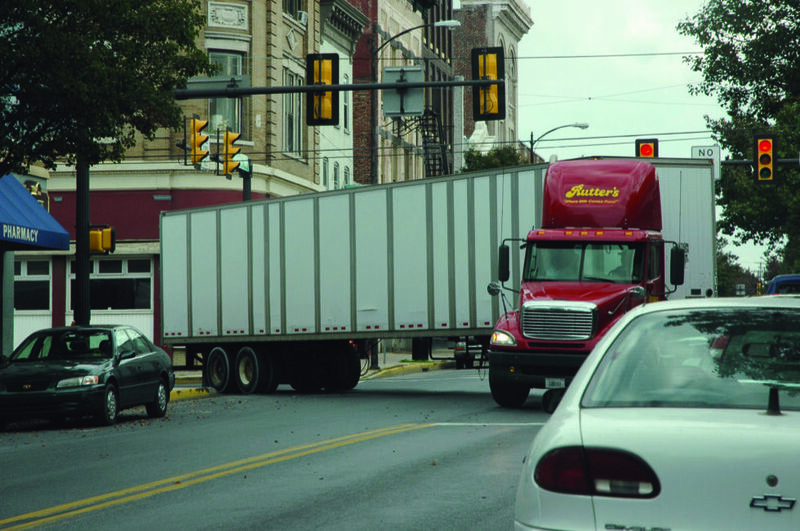 In infrequent instances where large vehicles need to make turning movements, personnel may be needed to direct traffic and “spot” the turning vehicle through a tight turning movement. Roadway striping has been found to be a cost-effective temporary measure to help enforce traffic calming goals and modify driver behavior. 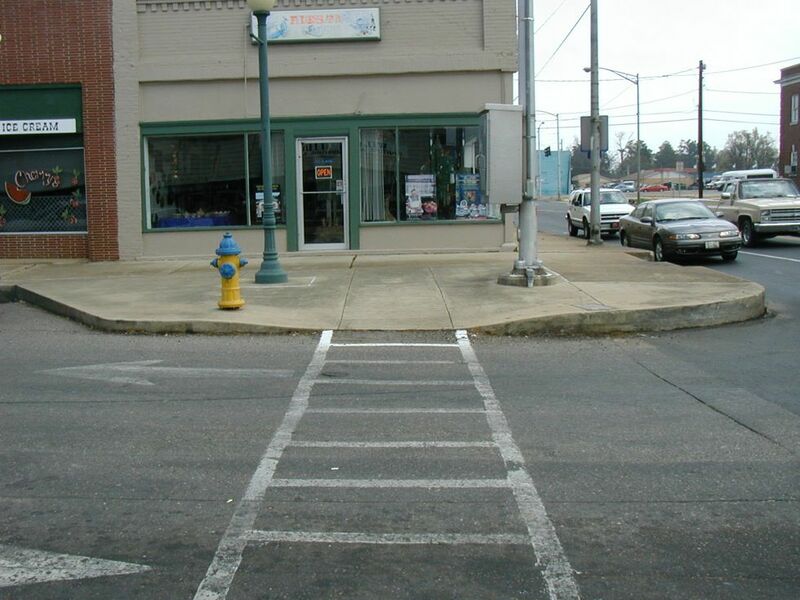 Robert Kahn and Allison Kahn Goedecke, “Roadway striping as a traffic calming option,” ITE Journal: 81 (September 2011). Source: American Association of State Highway and Transportation Officials. A Policy on Geometric Design of Highways and Streets. Washington D.C.: 2011; Formula 3­8. American Association of State Highway and Transportation Officials. A Policy on Geometric Design of Highways and Streets. Washington, D.C.: 2001. City of San Francisco. 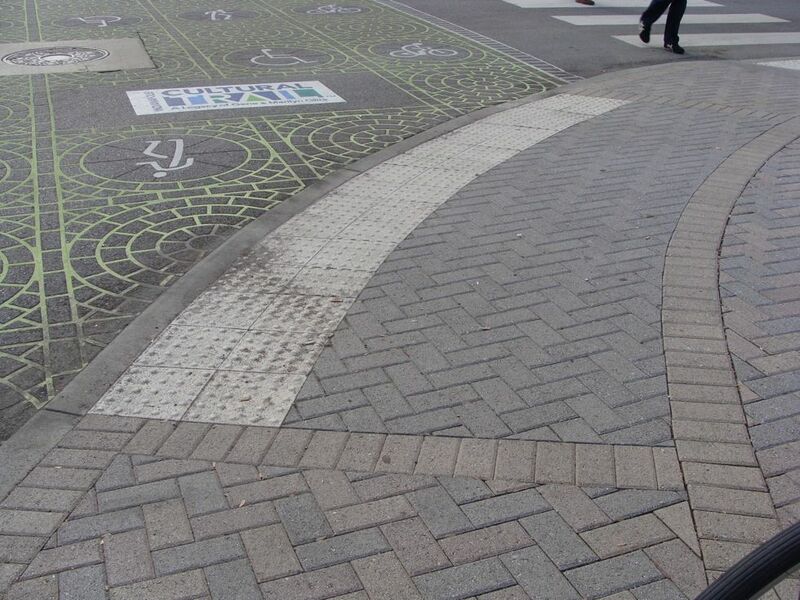 “Channels and Runnels.” San Francisco Better Streets: A Guide to Making Street Improvements in San Francisco. San Francisco: 2013. Connecting Charlotte. Curb Return Radii Design Guidelines. Charlotte: 2007. Dixon, Karen K., John L. Hibbard, and Heather Nyman. 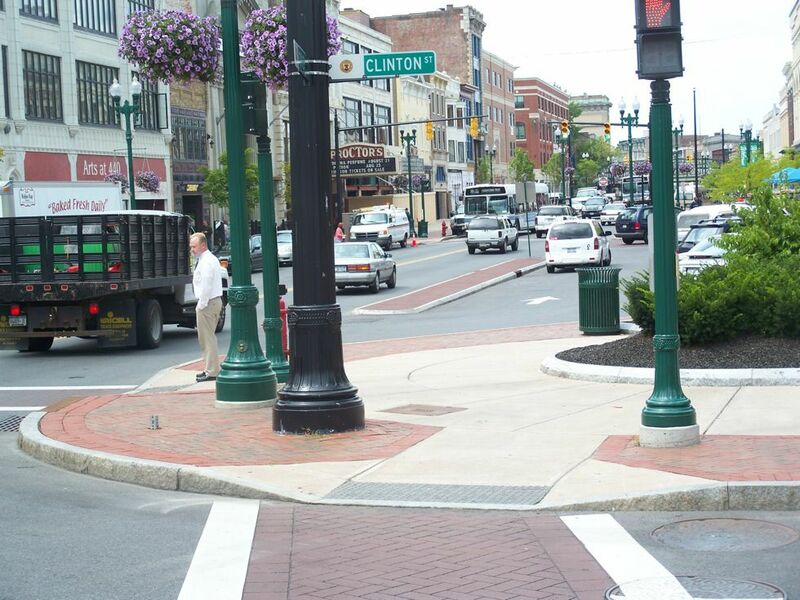 "Right-Turn Treatment for Signalized Intersections." Transportation Research Board Urban Street Symposium in Dallas (2000): 1-11. Donnell, E. T., M. L. Adolini, D. J. Torbic, J. M. Mason, and Lily Elefteriadou. "Truck Safety Considerations for Geometric Design and Traffic Operations." Proceedings of the ITE 2001 Annual Meeting and Exhibit, Chicago, August 17-21, 2001. Fitzpatrick, Kay and Mark Wooldridge. “Recent Geometric Design Research for Improved Safety and Operations.” Transportation Research Board NCHRP Synthesis 299 (2001): 1-144. Fitzpatrick, Kay and William Schneider. “Turn Speeds and Crashes within Right-Turn Lanes.” Federal Highway Administration Report FHWA/TX-05/0-4365-4. Texas Transportation Institute, Texas A&M University System, 2005. Hummer, Joseph E., Charles V. Zegeer, and Fred R. Hanscom. “Effects of turns by larger trucks at urban intersections.” Charlotte: Transportation Academy, Department of Geography and Earth Sciences, University of North Carolina at Charlotte. 1998: 64-74. Kahn, Robert, and Allison Kohn Goedecke. 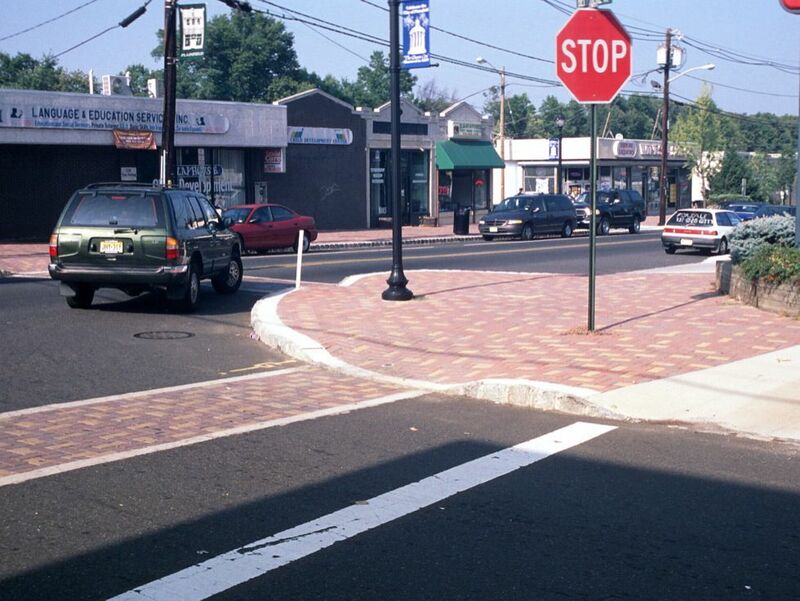 “Roadway Striping as a Traffic Calming Option.” ITE Journal (2001): 81, 30-37. Levine, Kendra. “Curb Radius and Injury Severity at Intersections.” Institute of Transportation Studies Library, University of California, Berkeley, 2012. Wolfe, F. Andrew, and Walter Lane. "Effect of Radius of Curvature for Right Turning Vehicles on Through Traffic Delay." Transportation Research Circular E-C018: 4th International Symposium on Highway Capacity (2000): 388-396. References for Corner Radii: 4 found. American Association of State Highway and Transportation Officials. "A Policy on Geometric Design of Highways and Streets." American Association of State Highway and Transportation Officials, American Association of State Highway and Transportation Officials, Washington, DC. Charlotte Department of Transportation. 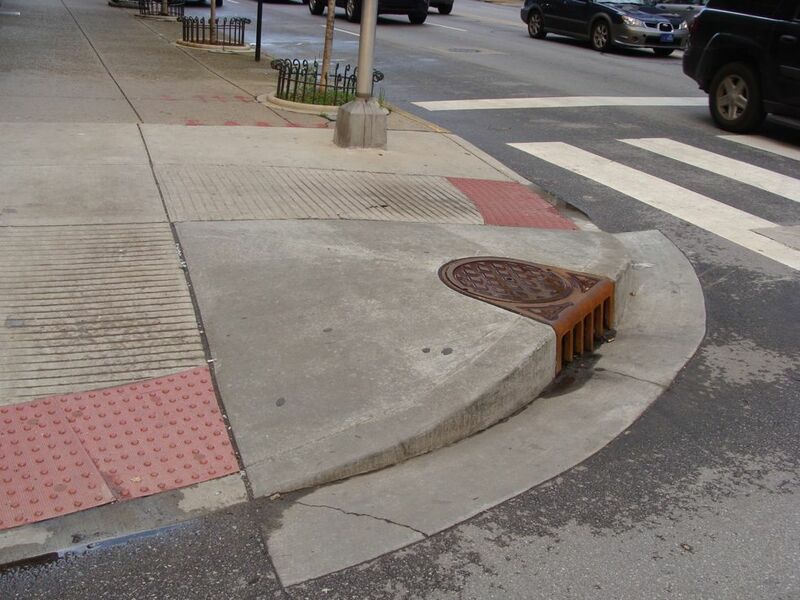 "Urban Streets Design Guide, Appendix C: Curb Return Radii Design Guidelines." Charlotte Department of Transportation, City of Charlotte, Charlotte, NC. Levine, Kendra. 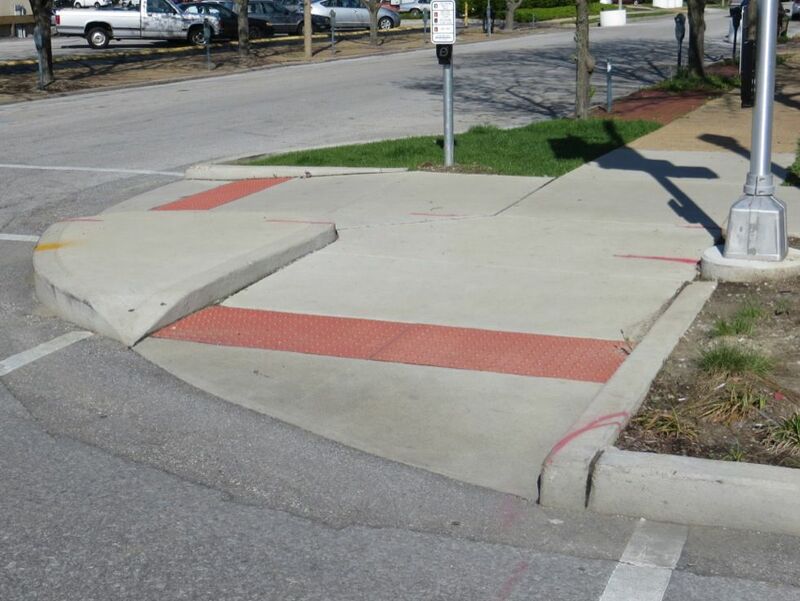 "Curb Radius and Injury Severity at Intersections." Institute of Transportation Studies Library, University of California, Berkeley, CA. Varat, Adam, & Cristina Olea. 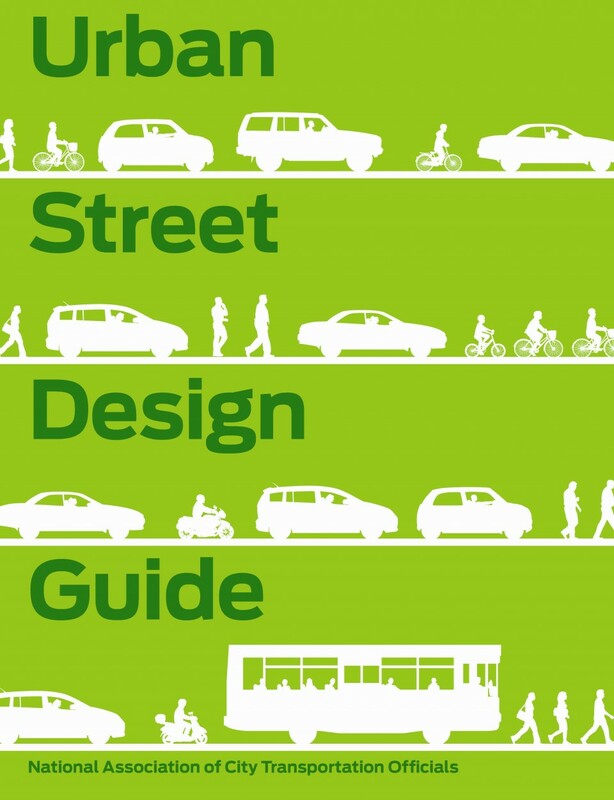 "San Francisco Better Streets Plan, Ch. 6: Streetscape Elements." Planning Department, & Municipal Transportation Agency, City of San Francisco, San Francisco, CA.